At Thanksgiving, my father and I got to talking about the sublime pleasure of head cheese. 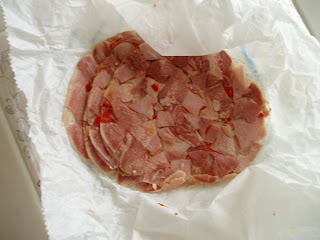 Head cheese is something approaching a euphemism, because it is not really cheese, but it is indeed head. Basically, it is a terrine of the brains of a calf or pig. It doesn’t necessarily need to be exclusively the brain, but my father suggested that is what “makes it taste so good.” Being the aficionado of all foods fairly disgusting, with me coming in a close second, I am inclined to believe him. The adventurous among you might not think any of these are that disgusting, but ask yourself why these are kept in the far corner of any self-respecting supermarket, except the really good ethnic ones. Head cheese or brawn is in fact not a cheese, but rather a terrine of meat from the head of a calf or pig (sometimes a sheep or cow) that would not otherwise be considered appealing. I am not sure it is that appealing even after it is prepared into a terrine, guy.